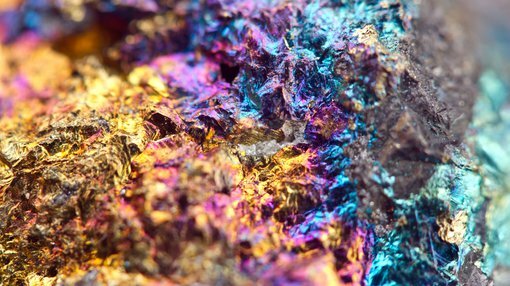 Drilling by Archer Exploration Limited (ASX:AXE) has confirmed ‘particularly encouraging’ copper and gold mineralisation at its Blue Hills Copper Project in South Australia. The recently completed Rotary Air Blast (RAB) geochemical drilling program at the project comprised 226 holes for 2,661m, providing a first pass test of previously identified soil geochemical anomalies. It intersected strong anomalous copper and widespread gold in bedrock on each line of drilling. The levels of copper anomalism found in the bedrock reach a maximum of 0.15% (1,500 ppm) copper but are typically in the range of 14 - 881ppm (0.001% - 0.09%) copper. Anomalous gold in bedrock achieved a maximum of 401ppb (0.4 g/t) gold, with grades typically in the range of 1 – 13ppb (0.001 – 0.0013 g/t) gold. AXE had previously completed a large (+4,500 samples) geochemical survey at Blue Hills which led to the discovery of the Hood, Katniss and Hawkeye prospects — as seen on the map below. However, during this earlier exploration, AXE found that some of the target area was covered by transported soils meaning that RAB drilling through the soils was needed to test the underlying bedrock. The key objective of the drilling was to confirm the presence of copper in the bedrock at Hood, Hawkeye and Katniss as well identify any anomalism under cover at both Ygritte and Legolas. The RAB drilling not only identified copper mineralisation in the bedrock, but also led to the discovery of associated widespread gold mineralisation. The discovery of widespread gold in the system has led to AXE resubmitting previous soil surveys from Hood, Katniss and Hawkeye to assay for gold. These results are expected in the next 2-3 weeks. The results from the limited RAB drilling, and the geophysical modelling undertaken, further supports the model that the copper and gold mineralisation at Blue Hills is associated with an intrusive related style of mineralisation. AXE Executive Chairman, Greg English commented: “This round of RAB drilling at Blue Hills was designed as a reconnaissance program across the strong surface soil copper anomalies that have been previously identified. The drilling program sought to establish whether the surface copper was also present in the bedrock. 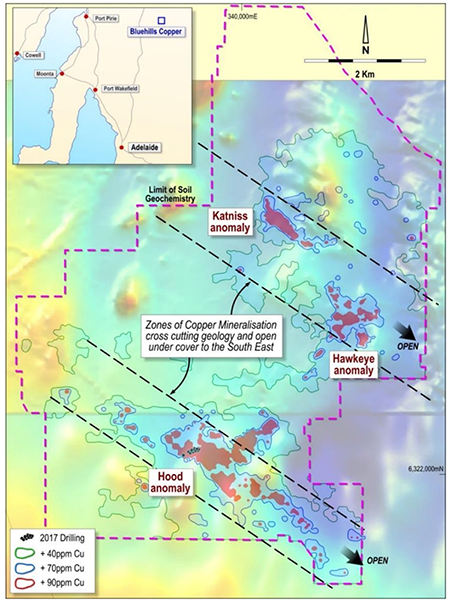 “The discovery of widespread gold mineralisation associated with the copper gives strong support that the mineralisation is associated with nearby intrusive systems. The results from the RAB drilling program at Blue Hills are particularly encouraging, with copper in the bedrock having been identified over 3.7km, 3.0km and 1.4km of strike at Hood, Hawkeye and Katniss respectively. The company has received a substantial amount of data from this program and is continuing the process of working through the information to enhance its understanding of the Hood, Hawkeye and Katniss prospects to help direct future exploration efforts. A preliminary review of the results, together with the existing extensive geochemical and geophysical datasets, has identified a number of new standout drilling targets and areas within the anomalies for follow up field work.